Dutch water company and Blood Bank combining forces in a new, sustainable and profitable source for cooling. As world-wide proclaimed, energy gained from fossil materials is not inexhaustible, certainly not to the extent of which we are using energy right now. For example, regarding to the use of and demand for cold, this is increasing for our buildings and will not be less with warming up the earth. It is time for us to search for and implement cooling technologies working on alternative energy sources to make the transition to a more sustainable world. In Amsterdam we do this in a very special way, that has a lot of potential to be scale up. 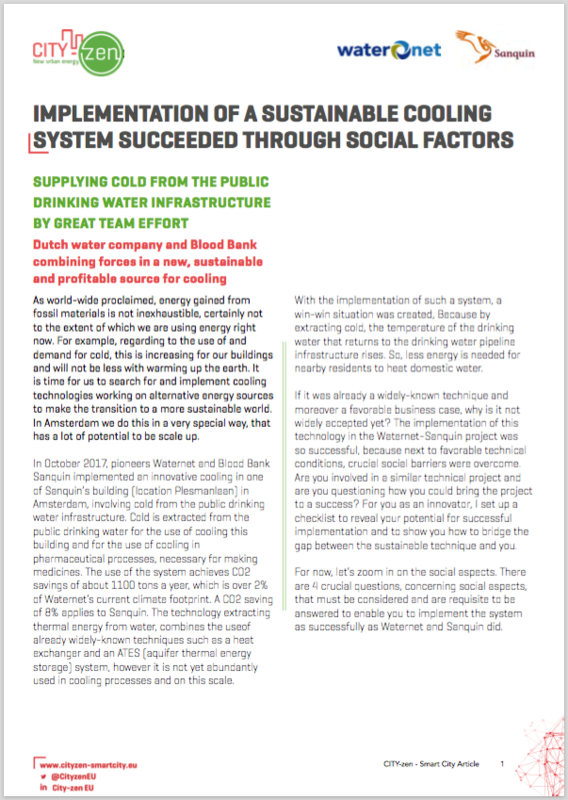 In October 2017, pioneers Waternet and Blood Bank Sanquin implemented an innovative cooling in one of Sanquin’s building (location Plesmanlaan) in Amsterdam, involving cold from the public drinking water infrastructure. Cold is extracted from the public drinking water for the use of cooling this building and for the use of cooling in pharmaceutical processes, necessary for making medicines. The use of the system achieves CO2 savings of about 1100 tons a year, which is over 2% of Waternet’s current climate footprint. A CO2 saving of 8% applies to Sanquin. The technology extracting thermal energy from water, combines the useof already widely-known techniques such as a heat exchanger and an ATES (aquifer thermal energy storage) system, however it is not yet abundantly used in cooling processes and on this scale. With the implementation of such a system, a win-win situation was created, Because by extracting cold, the temperature of the drinking water that returns to the drinking water pipeline infrastructure rises. So, less energy is needed for nearby residents to heat domestic water. If it was already a widely-known technique and moreover a favorable business case, why is it not widely accepted yet? The implementation of this technology in the Waternet-Sanquin project was so successful, because next to favorable technical conditions, crucial social barriers were overcome. Are you involved in a similar technical project and are you questioning how you could bring the project to a success? For you as an innovator, I set up a checklist to reveal your potential for successful implementation and to show you how to bridge the gap between the sustainable technique and you. For now, let’s zoom in on the social aspects. There are 4 crucial questions, concerning social aspects, that must be considered and are requisite to be answered to enable you to implement the system as successfully as Waternet and Sanquin did.